Murder by Gaslight: An Ancient Mystery Solved. The Perpetrator of One Murder, Which Led to Four Others, Discovered. Seymour, Ind., Nov. 28. – An old murder mystery, resulting in four other tragedies, has just been cleared up. Moore Woodmansee, a wealthy merchant of Medora, nineteen miles from here, came to Seymour, January 3, 1866, on his way to Cincinnati. He had $2,000 with which to purchase goods. He was missed from his room at the Roder House, and the cause of his disappearance was a mystery until October, when his body was found in White River, with the head cut off. Gordon Kinney, an employee of the hotel, was suspected of the crime. 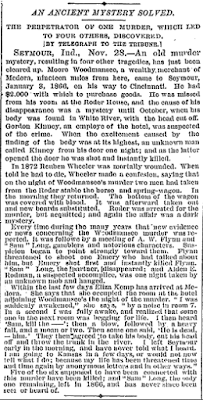 When the excitement caused by the finding of the body was at its highest, an unknown man called Kinney from his door one night; as the latter opened the door he was shot and instantly killed. 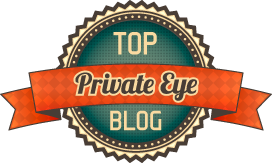 In 1872 Reuben Wheeler was mortally wounded. When told he had to die, Wheeler made a confession, saying that on the night of Woodmansee’s murder two men had taken from the Roder stable the horse and spring-wagon. In the morning they returned. The bottom of the wagon was covered with blood. It was afterward taken out and new boards substituted. Roder was arrested for the murder, but acquitted; and again the affair was a dark mystery. 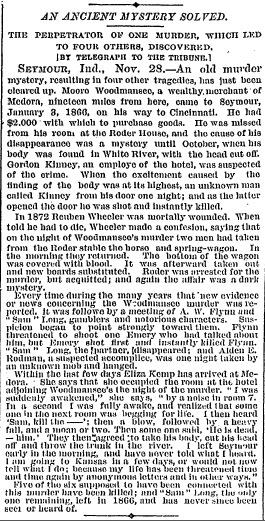 Every time during the many years that new evidence or news concerning the Woodmansee murder was reported, it was followed by a meeting of A. W. Flynn and “Sam” Long, gamblers and notorious characters. Suspicion began to point strongly toward them. Flynn threated to shoot one Emery who had talked about him but Emery shot first and instantly killed Flynn. 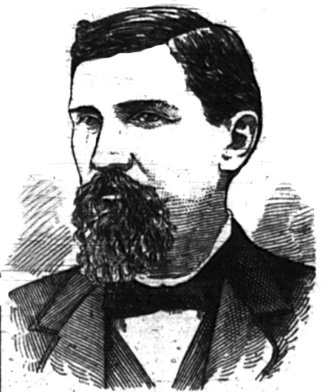 “Sam” Long, the partner, disappeared; and Alden E. Rodman, a suspected accomplice, was one night taken by an unknown mob and hanged. Five of the six supposed to have been connected with this murder have been killed; and “Sam” Long, the only one remaining, left in 1866, and has never been seen or heard of. "An Ancient Mystery Solved.." New York Tribune 29 Nov 1883. I love mystery's and this one kept me glued to the words....thanks..